A landscape firm’s large garden serves its staff and the community. 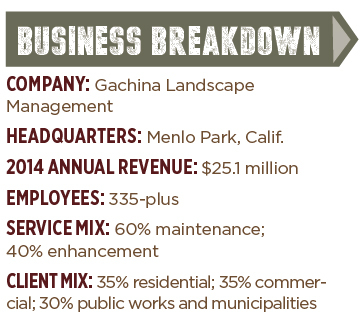 Gachina Landscape Management in Menlo Park, Calif., has practiced sustainable gardening as part of some of its maintenance contracts for nearly a decade. It naturally parlayed those skills into its own project: a large garden area it calls The Farm. The Farm, launched in January 2014, is located about three blocks away from Gachina’s headquarters. The one-acre lot is divvied up into company parking, a supply holding yard and the 5,500-square-foot farm. This project hasn’t only been an employee learning experience, it’s also been an excellent community outreach opportunity. Of course, not being able to apply any herbicide for weed control has posed challenges, such as a lot of hand pulling, says Callaghan. 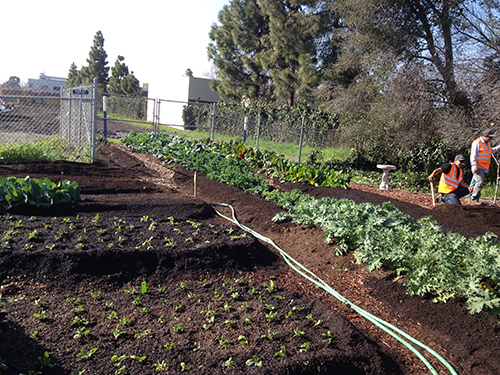 But volunteers’ enthusiasm about cultivating an organic site has made it doable. Volunteers include students from JobTrain, a vocational training program from which Gachina rents space for The Farm. Three salaried and four hourly Gachina employees also support the garden, to the tune of about 20 man-hours per week. Another challenge has been the lack of automated irrigation, which caused some of the plants to die prematurely. Callaghan acknowledges there has been a learning curve for many employees, as they get more comfortable with organic practices. Callaghan says that in addition to being a learning opportunity for employees, The Farm has given the company a chance to show clients that the company truly “walks the talk.” She adds that The Farm has helped increase clients’ confidence and they have a physical site to show future clients who are interested in this kind of work. The company spends about $3,000 per month in labor and materials on the garden. Gachina has also partnered with a local culinary class. Every Monday, the students harvest the vegetables/fruits with a chef. Volunteers also harvest produce, which is delivered to three of the company’s branch locations to be distributed to employees. Extras go to the volunteers.